U of R's latest gallery showing recently opened, featuring work from the University of Redlands' own art faculty. Although, as a recent graduate with a major in studio art, I’ve become close with most of these professors and am quite familiar with their work, I was surprised to discover what they had in store. Professor of Sculpture Raúl Acero had several pieces in the Art Faculty Show, my favorite of which was a collection of four ceramic tiles titled a hard rain. Hanging together on a wall, the four depict different leaves and plant segments, perhaps in various rain-dampened stages of growth and decay. A portion of “a hard rain” by Professor Raúl Acero. Munro Galloway, professor of painting, graced the gallery with a barrage of color, his layered, abstract paintings lining an entire wall. Visitors to Galloway’s spring 2017 show, Four Years, will immediately recognize the style. Professor of Drawing Anna Gaitan also brightened the room with her piece titled A Simple Flick of the Wrist, although the enormous silk-screen-printed pattern must have taken far more effort than the title suggests. 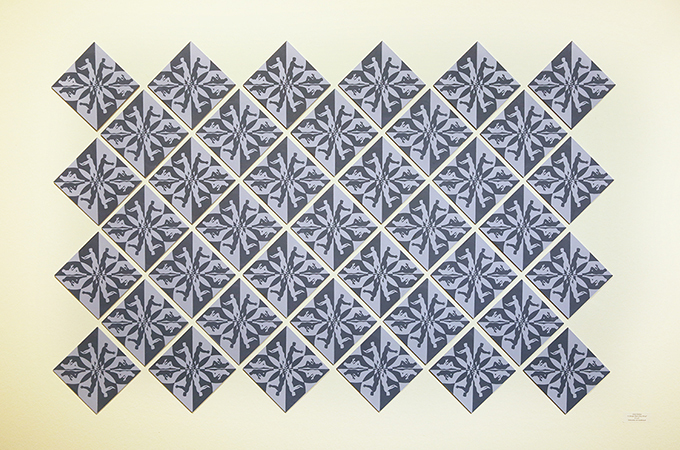 Professor Anna Gaitan’s silk-screen-printed “A Simple Flick of the Wrist” outsizes the viewer, as each hardboard tile is 6"x6". Sadie Red Wing, who is now pursuing her interest in becoming a faculty member after holding a position as U of R’s assistant director of Native Student Programs, is a seventh-generation Lakota and Dakota. Her pieces in the show, which feature several Native American icons such as the buffalo, pay homage to her heritage. Also new to the art faculty scene is Scott Klinger, whose mysterious series of black and white photos depict messages written in Morse code in otherwise-natural settings. Those familiar with the work of Professor of Photography Tommi Cahill will be surprised at how serene and still her photos are, as well as how little space they take up. A major step away from her spring 2018 show Hypnogogia, which she created based on her experiences with sleep paralysis, Cahill wanted to take a quieter approach to her art. Professor of Digital Imaging Jeff Wilson’s piece still confounds me. 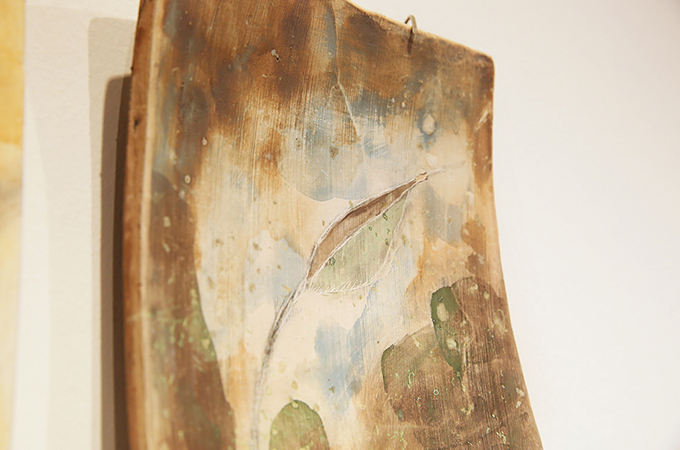 Titled For Kate, twin panes of glass sit front to back atop a wooden base. 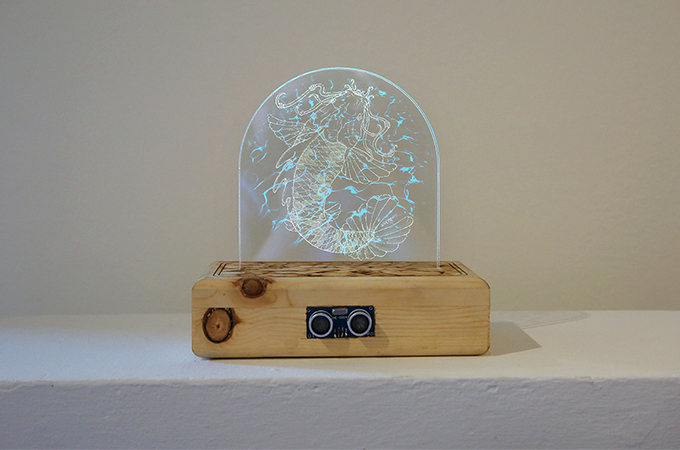 Depending on the angle and distance at which a viewer approaches the piece, an elaborate yellow fish appears in one pane, and rivulets of water appear in the other. “Ultrasound” was listed as one of the materials making up the piece, so I surmised the waxing and waning of the water and fish must lie in my approach and retreat from the piece—but just how did it work? And who is, or was, Kate? I kept wandering back to Wilson’s creation with puzzled curiosity. Professor Jeff Wilson’s “For Kate” piques a viewer’s curiosity as the fish and water wax and wane. 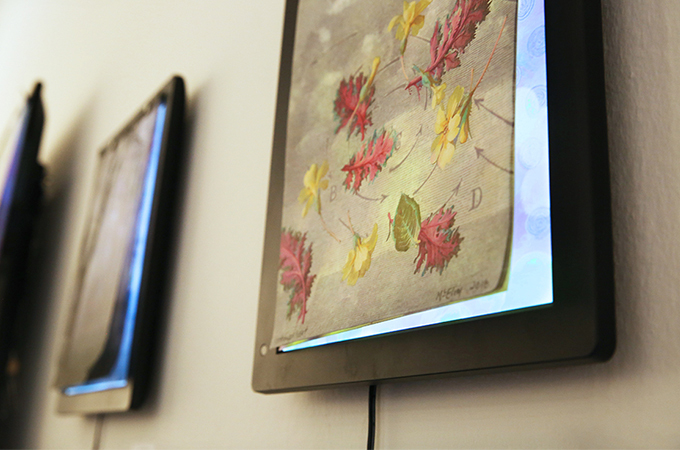 Professor of Graphic Design Penny McElroy’s backlit, multilayered pieces returned to the gallery this year. Not only have they evolved in complexity from the related pieces she has exhibited over the past two years—due primarily to her increasing mastery of electronics for the LED lights—but the meaning behind all those layers has also changed. 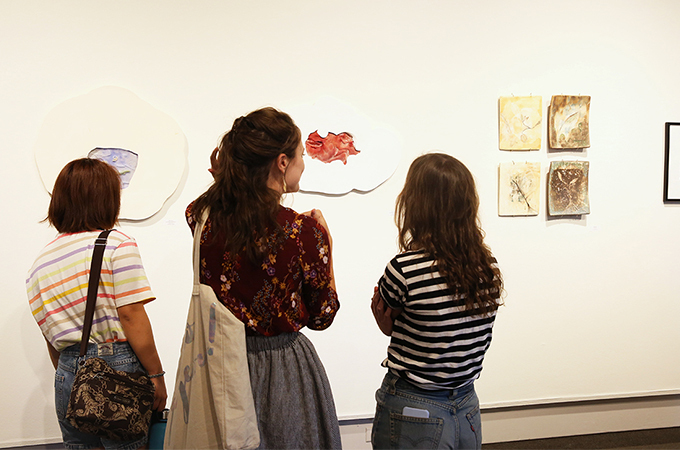 The Art Faculty Show will be open on the Redlands campus at the Gallery on Colton Avenue until Sunday, October 21. It is open from 1–5 p.m. Tuesday through Friday, and from 2–5 p.m. on Saturdays and Sundays.